Green Planet Homes is excited to sell Real Milk Paint. The first in a series of non-toxic, no or low VOC (Volatile Organic Compounds) products we will offer. Milk paint is a natural paint, which has been around for generations. Traditionally these products have been made of casein, or other milk products mixed with lime. 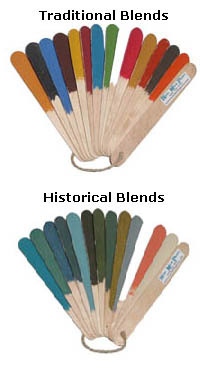 These paints were made and used in the home and mixed with mineral or plant tints to get warm colours. Real Milk Paint has revived this lost art providing the same type of product in a dry form with tint already mixed in. Simply mix with water and apply! Real Milk Paint have an extensive colour chart which can be seen on their website at: www.realmilkpaint.com or ordered through us at Green Planet Homes. If you already own a straw bale home, you likely know about the breathablity of your walls and how important it is to maintain this feature. Real Milk Paints are completely breathable and as such will maintain the porosity of your straw bale walls. If you restore furniture or need to remove paint from difficult places we highly recommend our new Soy based paint stripper. It is an eco-friendly paint stripper which will not burn your skin should you get some of it on you. Need an eco-friendly solvent? Try our new citrus solvent. It can be substituted for conventional solvents in most uses, reducing your VOC exposure. Looking for Tung oil? We now carry Tung nut oil for finishing wood or sealing your Real Milk Paint.